For the "foolproof" and professional preparation of Rough and Smooth Deck. With this worldwide unique set of innovative utilities for the rough and smooth preparation of playing cards you can easily produce your own Invisible Decks, Brainwave Decks and many more in an unseen quality. Now YOU can even do it better than the pros! 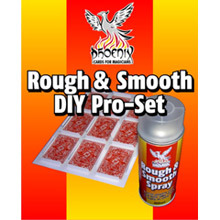 The Phoenix Rough & Smooth Spray is a fast drying and non-yellowing special coating for playing cards. Due to the new formula the treated cards will get rough but - if applied correctly - will not lose their glossy look. A never seen quality, not to be compared with finishes of a hardware store! Very efficient and long lasting. This Spray-Grid allows the space-saving and efficient rough and smooth preparation of up to 54 poker size cards (e.g. Phoenix or Bicycle). Never again cards flying around during spraying, sticking together or other unexpected mess. Due to the tight positioning the roughing fluid is applied very efficiently. With these covers you can easily prepare half-sprayed playing cards for surprising and new effects. The special construction of the covers allows soft blends instead of sharp obvious edges.